Real Madrid defender Raphael Varane is considering his future at Real Madrid and could leave the club in the summer. Varane joined Real Madrid from Lens for a reported fee of €10 million in the summer of 2011. The Frenchman has been at the club for the past 8 seasons and has won everything there is to be won in Spain and in Europe. He has thus far made 165 appearances for the Spanish giants and has won 4 Champions League titles, 2 La Liga titles, 3 UEFA Super Cups, 1 Copa Del Rey, 4 FIFA Club World Cups and 2 Supercopa de Espana. He has also been a part of the UEFA Team of The Year in 2018 and also made it in the FIFA FIFPRO World XI the same year. He also lifted the prestigious FIFA World Cup trophy last year with France and was one of the core members of Didier Deschamps's side. He made it to the Balon d'Or top-10 list too. 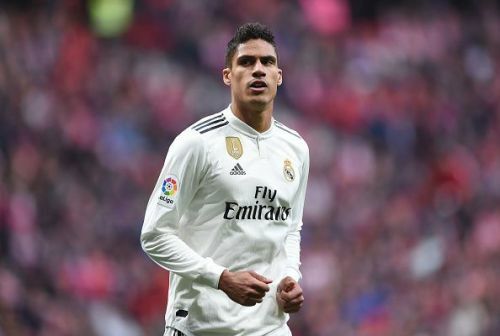 According to the French newspaper L'equipe, Varane is considering his future at Real Madrid and wants to "challenge himself again". The reports surfaced after the recent signing of Brazilan center-back Eder Militao, who will join the Los Blancos on a 6-year contract in the summer. The 25-year-old is one of the most sought-after defenders across Europe. Manchester United have already shown their admiration for the World Cup winner and will be keeping a close eye on the situation. They desperately need a centre-back in the summer and Varane fits their profile. He's young, he's pacey and he has plenty of experience at the highest level. If he does leave in the summer, Real Madrid won't let him go for cheap. He can become the first €100 million defender and big clubs won't mind splashing that amount of money for the talented Frenchman. The reports come from a source which is pretty reliable concerning French players and the news might have some substance to it, especially as Zinedine Zidane recently bought a €50 million defender. It will be interesting to see how he handles the questions regarding Varane's situation in his press conferences after the international break.